New River Valley Historic Dance Society - Dance and Play for Every Day! Most 2nd & 4th Tuesdays (starting April 2013). Place: Sapphire Ballroom and Dance Center, 30 West Main Street, Christiansburg., Virginia. join our ListServ and receive meeting announcements or "like" us on Facebook. 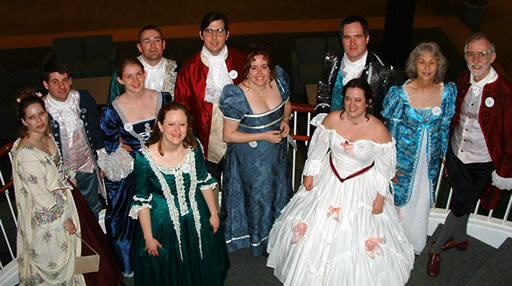 Members of NRV Historic Dance all dressed up for the Williamsburg Ball. Enjoy history? Like to dance? 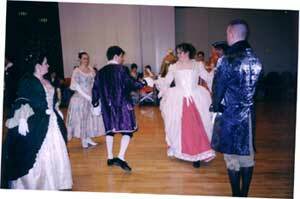 Have you seen grand balls and country dances in historical dramas on A&E or PBS and thought it looked like fun? It is! This form of dance is called English Country Dance and there is group here in the NRV that would love to have you join in the fun. This dancing is as energetic as you want it to be and most dances can be walked through. All dances are taught each time.